You must have previously attended an introductory level course or have some single point harness experience on the wall. Please wear multiple snug layers around your hips & waist for your comfort, long sleeved shirts are also handy for some moves. If you have a preferred climbing harness and any kit (gri gris, rigs, carabiners etc), please bring them with you. Magalie is a dancer, performer and teacher with training in contemporary and aerial dance. Currently residing in Lisbon, it was there that she discovered the world of the circus in Armazém 13 Circus Project, where she receives training, particularly focused on aerial dance. She performed with "Gravity and Levity" in "Rites of War"- UK Tour 2014, created by Lindsey Butcher and Darshan Singh Bhuller. In 2011 Magalie created her own company L’Envers du Pied and choreographed a solo and trapeze dance" Entre... moi" performing it at a number of festivals including: Les Festival Rencontres de la Danse Aerienne in La Baule, France (2012, 2013), Festivox in Bordeaux, France (2011), Malaposta Festival, Portugal (2011), Ficadance Évora Festival, Portugal (2011), Almada Dance Festival, Portugal (2011) and Festival of Santa Barbara Centre for Aerial Arts, USA (2014). She is a teacher in the Olga Roriz’s company and works as a project assistant for the F.O.R. Dance Theater. She has also taught at the following festivals, schools and projects: European Aerial Dance Festival in UK; Les Rencontres de la Danse Aerienne in La Baule, France; Janze Circus Schools, in France and Armazém 13 project, Lisbon. 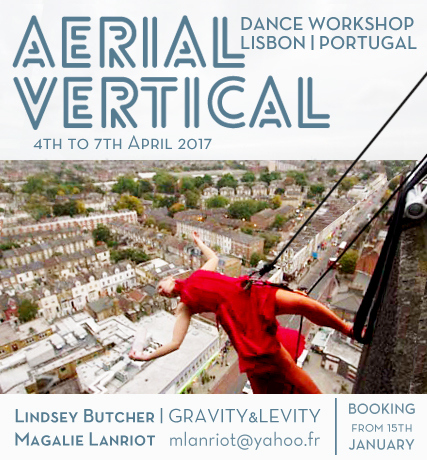 She is working in association with several studios, providing formation and research for aerial and contemporary dance in Portugal.